Our Juniors are of paramount importance in HLCGA as they are the future of our game. Our aim is to promote girls’ golf throughout Hampshire, the Isle of Wight and the Channel Islands. We do this by running events to help girls who wish to play golf, whatever their level of ability. Our junior team, managed by Marc Dack, have a number of friendly and competitive matches each season and represent the county at Junior County Match Week. The following training days and friendly matches have been scheduled for 2018. This year Middlesex will be hosting JCMW which will take place at Bush Hill GC, from 13th – 15th August. If your daughter enjoys golf, or perhaps is interested in taking up the sport then Hampshire Ladies’ County Golf Association (HLCGA) can help her. We run coaching, competitions and matches for girls of all ages and at all golfing levels. 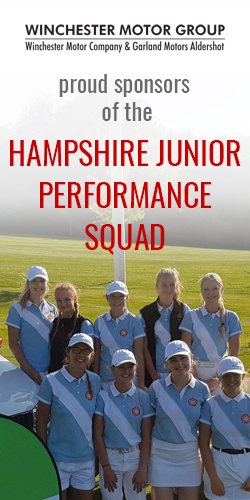 By participating in our programme your daughter will mix with other girls of similar ages and abilities and learn from Hampshire Golf Professionals. Our activities supplement the training and competitions offered by her golf club. If your daughter would like to take part in our Hampshire Girls’ Programme please complete both the Junior Player Parental Consent Form and Code of Conduct Form. Please also notify us as soon as you can if any changes occur to your child’s or your own personal information, including your child’s medical condition.